I can’t say that I’ve ever seen The Golden Bowl, set in the Edwardian era, but the first dress I’ll show from the Cut! 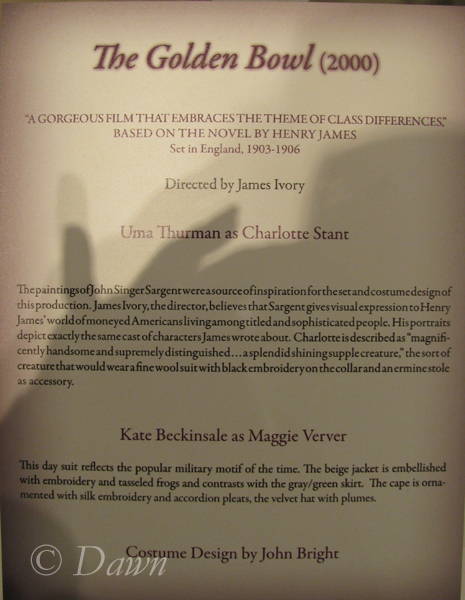 exhibit is Uma Thurman`s costume from the role of Charlotte Stant. The write up says that Charlotte is “magnificently handsome and supremely distinguished” and she wears a “fine wool suit with black embroidery on the collar and an ermine stole as an accessory”. Since I’ve never seen the movie, I thought I would look it up – first to see if there were screen caps of the costume (I couldn’t find any) and second to learn a bit more about the movie. A post on the Distracted Globe blog makes me think that perhaps I won’t bother checking it out. By the sounds of things, it’s a b-list movie that deserves to be firmly in the b-list. The outfit - the hat is just slightly to the left. I didn’t find this outfit especially inspiring actually – and thus didn’t take many photos of it. I was much more interested in the hat that matched the outfit. 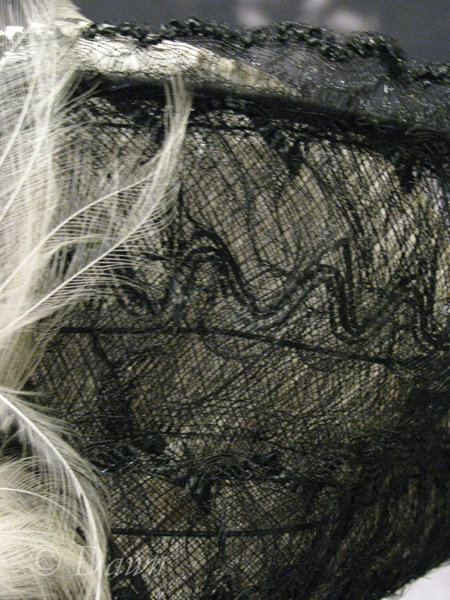 Without being about to touch the hat or look more closely at it, it appears to be a layer of black sinamay, with a second layered of gathered or ruffled sinamay on top creating the brim, trimmed in black lace. 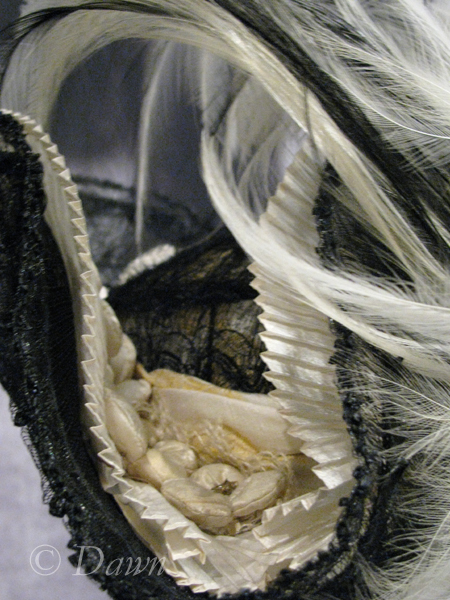 The top side of the brim is pleated ivory silk, and both sides are raised up against the crown. 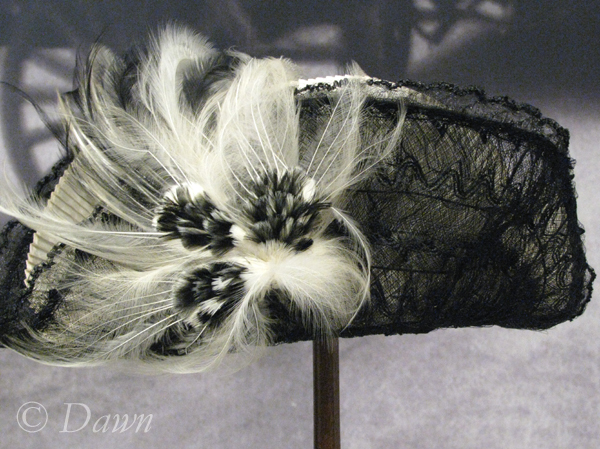 There`s a large feather decoration on the side of the hat. A close up of the sinamay. With the close up photo, I can see that there is a black wire structure supporting the brim as well. Where the crown meets the brim there are all of these ‘lumps’ of ivory. 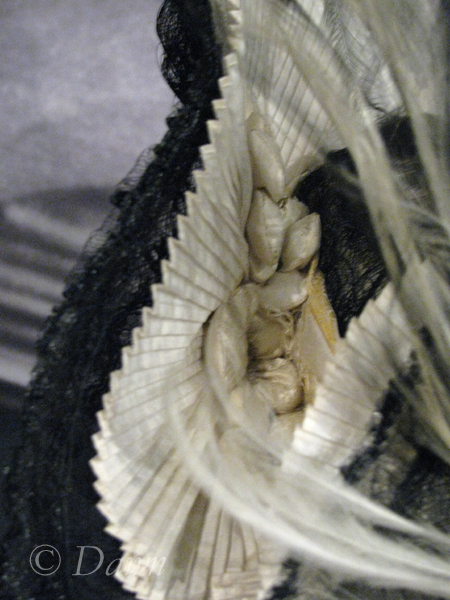 While I was at the show, I thought that these were parts of some sort of lace laying over the brim, but when I got home and got a better look at the photos, I realized that these are actually silk shapes sewn together, stuffed, and turned into a ‘flower’ of sorts with a rhinestone (button) centre. There is also apparently a cream silk band around the crown, and ivory lace as well. I couldn’t find much more from wandering around the internet – does anyone have any other photos or comments to share on this outfit? 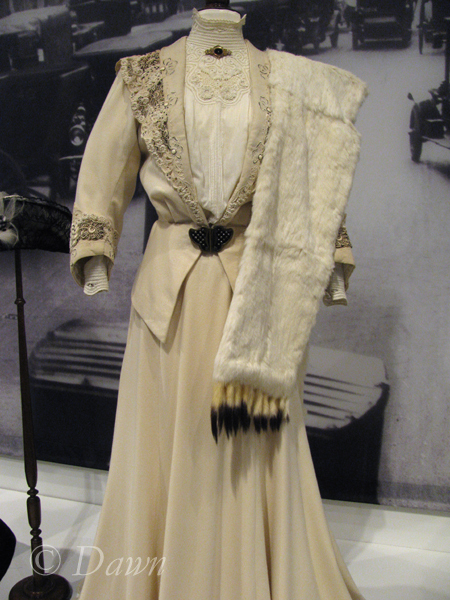 This entry was posted in Museum exhibits and tagged Edwardian, inspiration, millinery.